Angelina Jolie Is Executive Producing a Current Affairs TV Show for Children! Angelina Jolie is launching a new television series! The 43-year-old actress and activist is teaming up with BBC Learning, a division of BBC Studios, BBC World Service and Microsoft Education to launch an English-language current affairs TV show for an adolescent audience. Beginning with a pilot of ten episodes, the weekly half-hour program will be produced by the BBC World Service and executive produced by Angelina. The intention is to expand into multiple languages following the launch of the English-language version of the show. “All of us who have come together on this project feel a great responsibility towards young people. 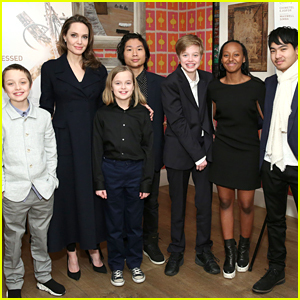 We want to make sure that we are able to put forward a news program that helps to give them a broad view of the world they live in and the issues they face, and that helps connect them to other children around the world,” says Angelina. Angelina Jolie's Son Maddox Is Heading to College This Fall! Angelina Jolie in Talks to Star in Upcoming Marvel Film 'The Eternals'! Arielle Kebbel to Play Angelina Jolie's Role in 'Bone Collector' Pilot for NBC! 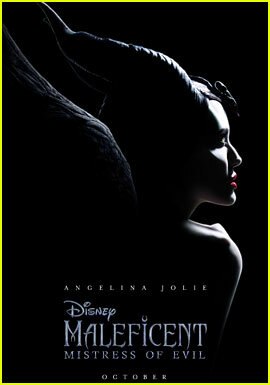 'Maleficent 2' Poster Reveals New Information About the Sequel! Angelina Jolie Steps Out After Family-Filled Weekend in NYC! 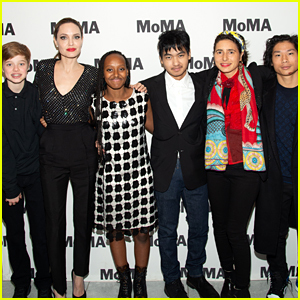 Angelina Jolie's Kids Join Her for NYC Movie Premiere! Angelina Jolie Has a Family Dinner in New York City! Good morning to everyone and wishing everyone a wonderful day. This is such exciting news. Left the actress’ explanation of her post about Angie and kids at other thread. Hi, Love. They are a little late on this, aren’t they. I believe they are. This was mentioned awhile back. I wonder if Jared is just picking this up. Yes, we probably needed a new thread. I am so happy for the Jolie-Pitt children. I think they will be a big help to Angelina with this. What great ideas they will have. Awwwwwww…..adorably funny and much appreciated. You too, Toastie. She is amazing! Hi Orianna, wishing you a beautiful day. Yes, this is important. As we read she did mention how her kids are seeing the falsehoods about them in the media. So this will help. Plus the kids are world travelers and see up close many things that other children face, that they do not. No telling what those kids have up their sleeves. 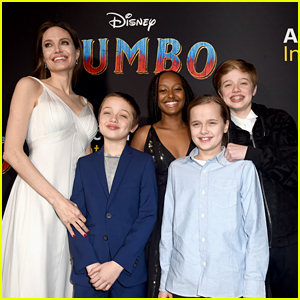 Glad they are able to do things like normal kids and Angie being so awesome in supporting them. 😘 😘 😘 Hoping all is going well with your weather and house repairs. Always nice to be with you lovely ladies. Weather is great. Thank you so much. All is well. Hope the same for you my love. I think they posted the news because of the pic, the pic is new, right? PS: JJ is only posting this now, because Microsoft is joining the project. I’m happy to hear that Jolie got the partnership from Microsoft, it’s not the first time she’s been able to join them for a project. Those kids are as amazing as their parents. World travelers! They look so happy and normal despite the lies written about them and their parents. I think their parents have done an outstanding job of rearing them to face the world and all its challenges. I saw the “Sarah Ramos” tweet on the other thread and LOVED it! to give them Angie as their mother” and he is right when he says he “HIT the Lottery” with Angelina for a wife. My heart is still with them, Toastie. I can’t give up on them. They have done so much good in this world. All of us who have come together on this project feel a great responsibility towards young people. Plans include launch of media literacy and journalism initiative in classrooms around the world. BBC Learning, a division of BBC Studios, in partnership with Microsoft Education, today announced plans to collaborate with BBC World Service and Angelina Jolie on their forthcoming global English-language, current affairs television programme for adolescents, previously announced in December 2018. In addition, BBC Learning and Microsoft have designed a global media literacy and student journalism initiative that ties in with the programme (name TBC). Microsoft will invest in both. The initiative will help give students, ages 7-14, the knowledge, tools and critical thinking skills required to understand, evaluate and contextualize news and also encourage them to be effective citizen journalists who can accurately report on the world around them. Beginning with a pilot of ten episodes, the weekly half-hour programme will be produced by the BBC World Service, which retains editorial oversight, and executive produced by Angelina Jolie. The primary objective is to help children have access to impartial information of the highest editorial standard and bring a deeper understanding of the different issues their peers face in other parts of the world. The programme will be truly global in scope, beginning with an English-language version but then expanding into multiple languages and engaging children from Argentina to Zanzibar. “The amount of media spread on the internet has mushroomed in recent years. But not all information is created equal,” says Brad Smith, President of Microsoft. Schools and students will be able to access the content for free once it becomes available. Further details and components of the initiative, including launch date, will be announced in the coming months. Thanks for that. Didn’t realize that. MS is a founding partner of KIND, so it’s not like Angie hasn’t partnered with them in the past. BBC Learning – part of the broadcaster’s outside Studios – is working in partnership with BBC World News and multinational corporation Microsoft to produce a set of learning resources to go along with the show. Thank you for this Bap. What a wonderful hook-up. Angelina and Microsoft. This is so very much needed in this world and at this time. I am literally jumping for joy. Yes they were. She has so many good friends in very high places. And she already works with Bill Gates to help children, via KIND, and to add this new wonderful service to the children of the world leave me without words to thank her, Gates and the BBC adequately. WASHINGTON (Reuters) – U.S. President Donald Trump is expected to back a short-term government funding bill, CBS and NBC reported on Friday, each citing a senior administration official. Debate over U.S. border security will continue, but such a stop-gap funding bill would allow federal workers to be paid and “take stress off (the) system,” an official told CBS News. Yes. The picture Jared has posted above, is new. Very much agree with you. Yes you are correct. He owns the Portland Trailblazers and Seattle Sea hawks. Lol I thought this was old….. This is a great idea and so needed in such a divided world. Hope Angie and all those involved have great success with this program.